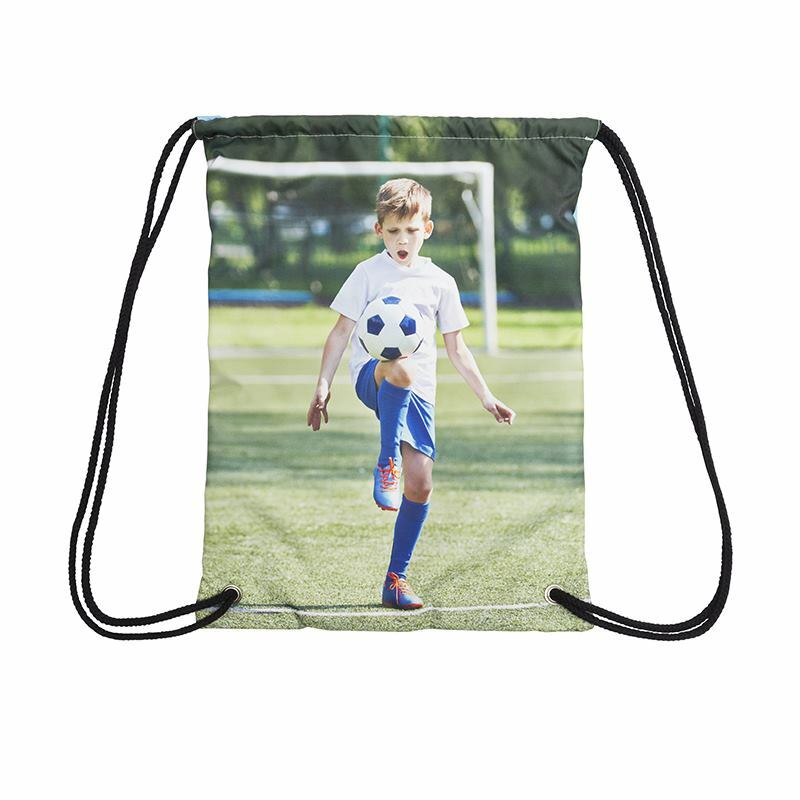 Create your own personalized drawstring bags that you design online with your favorite photographs and images. The sports bag is 100% waterproof. Plus, you can personalize both sides of the item with your favorite snaps, designs, or even text. All kids need Personalized Drawstring Bags to hold all their important items for the wide variety of activities they get involved in, and to locate it so they don't get lost. Whether it's soccer, football, hockey, or even tennis, these custom drawstring bags are the perfect way to transport everything. But too often they are printed with a generic monochrome design that is wildly unremarkable. So why not design your very own PE bag that you can give to your son, daughter, nephew or niece? Feel safe knowing that you are presenting something not only practical but beautiful. Being 100% waterproof and made from quality materials, it's such a useful piece of equipment that will come in handy again and again. The quality was good. The size was slightly smaller than expected. To my surprise, I was able to personalize the back of the bag which made it more amazing. I received the bag rather quickly. Considering it was personalized front/back, I expected 4 week delivery but instead received it in a week. Absolutely amazing! The pictures on my bag came out sooo nice and clear even better than what the original pics looked like online and the fabrics is nice and sturdy, and my bag came in in only a couple days!! the only problem I had with the bag is the strings kept slipping through the holes at the bottom but I just double knotted them and problem solved! The bag is great size for going to an from the gym! Really love it. My son is getting great use out of this bag while going from one practice to the next. Very happy with the quality. Both sides of this item can be customized with a range of your favorite photos in a collage. Additionally, our online preview system is extremely easy to use and will guide you through the quick steps to receiving your personalized drawstring bag. Create your own collage online by positioning your most memorable snapshots in any way that appeals you - it's great fun! The spacious interior of the bag means that it can hold a number of things at one time, making it perfect for a busy sporting schedule. If you are on the lookout for a top quality gift for a sporty, active child, our customized sports bag could well be the perfect option to choose. The 2 corners are fastened with durable eyelets, so the product has longevity as well as a uniquely personalized aspect. Print a cool action shot or a lovely photo with friends and give something that no one else in the world will ever have! Our designers work carefully with your photos to make sure that the final print is absolutely perfect, so feel free to get in contact with us and inquire whether your creative ideas might be feasible with the custom sports bag. To ensure your custom P.E bag is of an excellent standard, we use our specialist printing techniques to bond the ink to the fabric, rather than it just sitting on top which can lead to fading or abrasion. The fabric is then cut to size and the entire custom sports bag is hand sewn. Care Machine wash at 30°c as often as needed. Where the two metal eyelets sit, the fabric is cut out to make way for the drawstring, so ensure to keep key features or letters away from these corners as they may be lost. You have both sides to print on so think about the best way to make it easy for your child to recognize their bag, for example, one side could feature a family photo or a photo of their face, and the other side could have their full name printed out. This means whichever way the bag is facing, your child's personalized waterproof P.E bag can easily be detected, preventing loss or confusion. Photo collages are a great way to make the most of the spacious area to print on. School P.E bags personalized with photos of family and friends is a special way to turn something usually considered quite ordinary into a talking point amongst their classmates. To really showcase your child's personality and style, print their favorite kids show character or pop band - guaranteed they'll be popular in the playground! Making P.E bags personalized is a fantastic way of encouraging sports and activities, as they'll be excited to show it off but more importantly use it.